Geologist Pall Einarssonn: "The eruption has been declining"
Air traffic in Europe should be back to "almost 100%" on Thursday, after six days of unprecedented travel chaos, the air traffic agency Eurocontrol says. Airlines resumed services across Europe on Wednesday, with most scheduled flights going ahead. But tens of thousands remain stranded around the world after ash from an Icelandic volcano caused the shutdown. The airline industry says it has lost $1.7bn (£1.1bn) and has called for compensation from European governments. How do the stranded get home? The head of the International Air Transport Association (Iata), Giovanni Bisignani, said the impact of the shutdown had been "devastating" and governments "must take their responsibility" and help carriers. Eurocontrol said it expected about 22,500 flights to have taken place on Wednesday, out of a normal weekday total of 28,000. 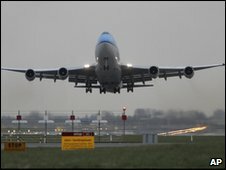 "It is anticipated that almost 100% of air traffic will take place in Europe" on Thursday, the agency added. At London's Heathrow airport, Europe's busiest, traffic ran at 90% normal service on Wednesday. Many night flights are being allowed temporarily to help clear the backlog of stranded passengers. Transatlantic services have returned to their normal level, with 338 flights arriving in Europe on Wednesday, Eurocontrol also said. German airline Lufthansa said it would fly at full capacity by operating about 1,800 flights on Thursday, up from about 700 on Wednesday. Air France says its long-haul flights are now departing as normal, although services in parts of northern Europe remained suspended. Denmark, Norway and Sweden - among the countries previously worst affected by the ash cloud - have now lifted the last of their bans. Some airspace restrictions remain over Finland and some remote Scottish isles. The flight bans were imposed by most European countries because in the high temperatures of an engine turbine, ash can turn to molten glass and cripple the engine. More than 95,000 flights were cancelled in the six days to Wednesday. Airlines conducted test flights during the weekend and called for the restrictions to be lifted, saying there had been no damage to planes. The curbs were eased after EU transport ministers met by teleconference on Monday, and tests showed ash density was low enough to fly. UK Transport Minister Lord Adonis has admitted that international safety regulators had been too cautious in their handling of the crisis. He also said UK airports had operated at about 60-70% of normal capacity, while tour companies were planning to get more than 200,000 holidaymakers back in the country by the weekend. 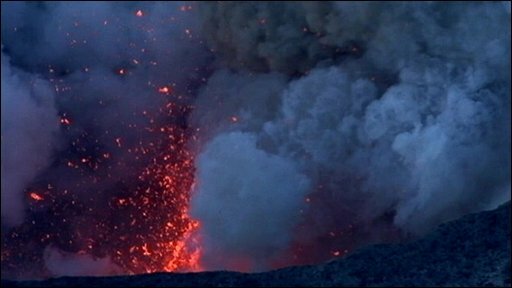 In Iceland, the civil protection agency said on Wednesday that the volcano had lost nearly 80% of its intensity, although the situation remained changeable.